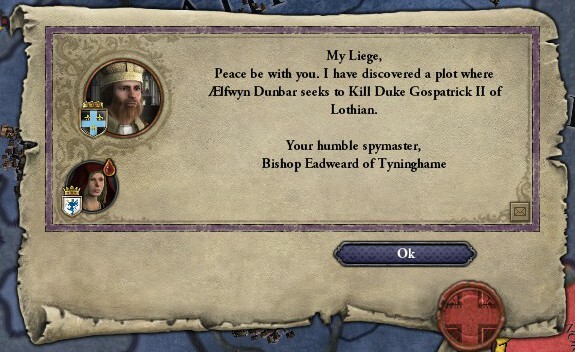 I am Duke Gospatrick II of Lothian. 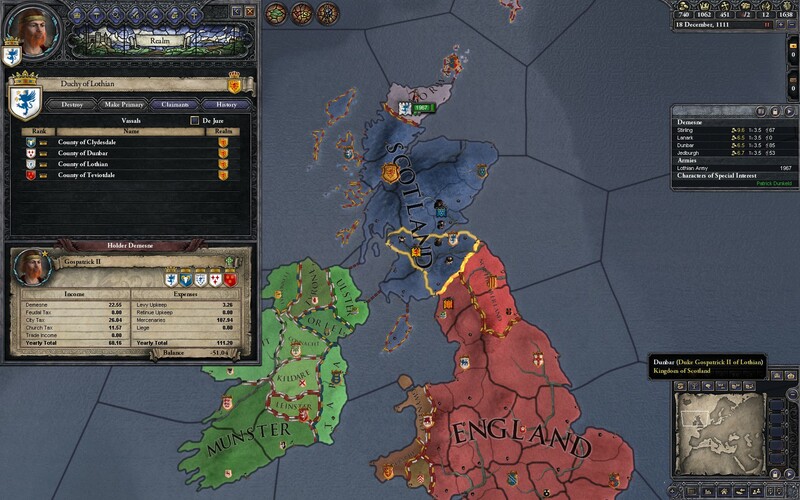 My Duchy lies within the Kingdom of Scotland, on the border with the English. Through generations of political manoeuvring, our family has been able to secure all of the counties within Lothian, thus securing an impressive personal holding ensuring taxes and warriors sworn directly to us – should we need them against any foe, foreign or domestic. So. What lies in our way? The first problem is that my dear sister has not born her husband any children. Boys in particular. They have not been married long, and she is but 23, so I just have to hope she is not barren. It could bring about the ruin of generations of planning (no pressure sis’) but all we can do is pray to God. 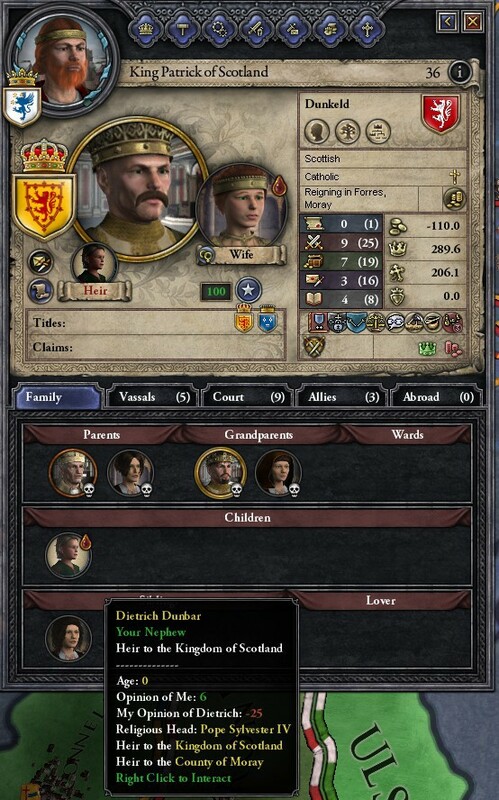 Perhaps the King’s cousin, Earl of Atholl (current heir to the throne), will take poorly to having his claim bumped in favour of a new child. He might even take steps to maintain his lineage. His Majesty can count on me to root out any such plots and put an end to them. And then there is my own children. 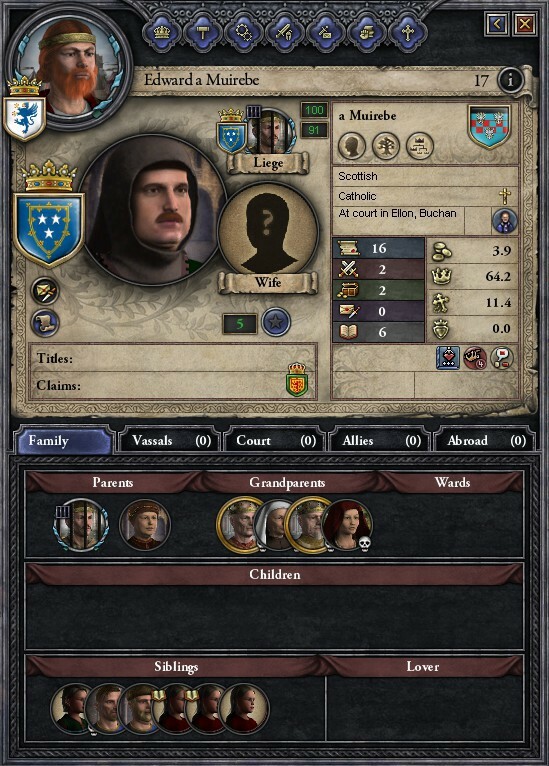 Only 6 years old, but still my son may well feel slighted when he is older and his father’s entire estate passes to his cousin. No matter! Once on the throne, we will press our claim on the County of Cumberland and begin marrying into the English nobility. The first wheel has fallen off the cart. Since I last played they have changed the amount of holdings you can personally have without serious penalties. Halved it in fact. So I can no longer hold all the Counties in my Duchy. This is a big hit to my original plan. I’m not sure whether to wait until a child is born to my sister and award it to him (who, as future King, may get a bigger Demensne) or find someone in my court I can safely off-load to. So which of my vassals do I want to curry favour with? There is Waltheof Dunbar. My cousin and Chancellor. He is a talented young man. That’s why I made him Chancellor. However I think the best thing to do will be to give both titles to my son. He’s already annoyed (at the tender age of 6!) 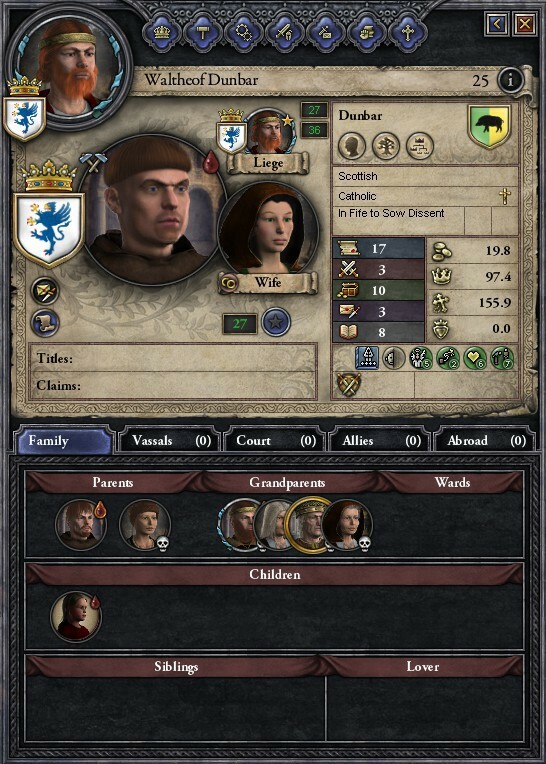 that the laws don’t say he automatically inherits, so I if I let him grow into some titles – he’ll be happy, my Demesne penalty will be eliminated and when I die and become his cousin I should have a fairly strong ally. So who is this Edward? And why would the Duke go to war in his name? Well, to answer the first question we just need to look at the last 6 Kings. You see the red shields? That is house Dunkeld. They’re slightly related to us Dunbars. The blue shield is house Muirebe. As you can see these two houses have been at it for generations. The crown flitting between them, giving descendants claims on the throne for them to squabble over for many years to come. You’ll also notice that last King – Laurence – he’s not dead. He’s in gaol. I might have had something to do with that when I put Patrick on the throne. This has made the Muirebes none-too-happy. Edward is Laurence’s son. As to the second question: when the Muirebes were on the throne, the Duchy of Gallway carried a lot of influence. It was a large contiguous Duchy that could call on many troops and had vast money stores. 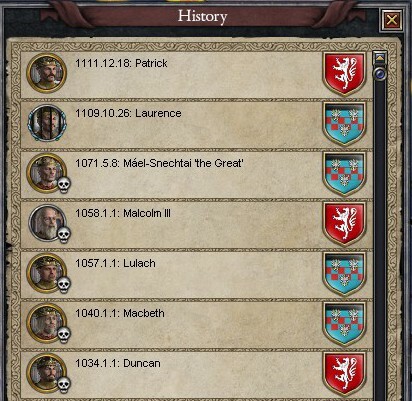 After the war of succession where I put Patrick on the throne, that Duchy was broken up and some of its Counties moved to more… appropriate holdings (i.e. mine.) I believe the Duke may want some of his previous prestige back. I believe the King and I have enough troops. Let’s hope so. The war was short-lived. The Duke’s armies were smashed by our levies. 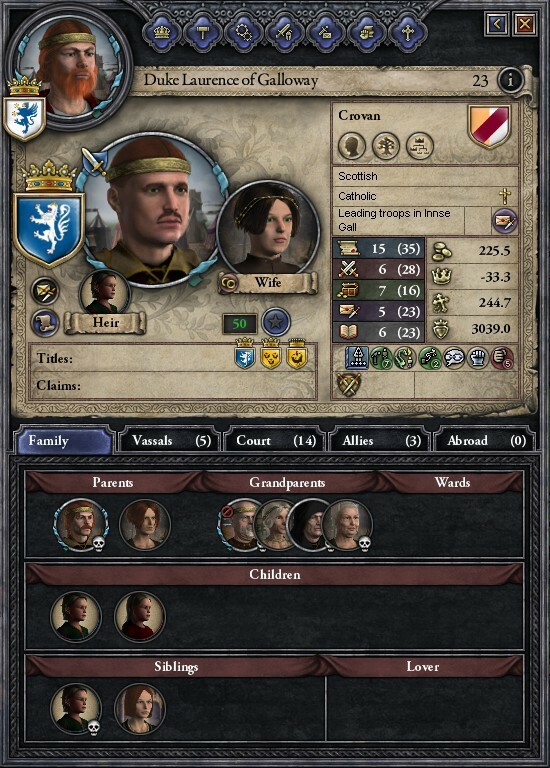 I didn’t have the men to siege the Duke’s castle and force a surrender, though, so I hired some mercenaries to do it for me. 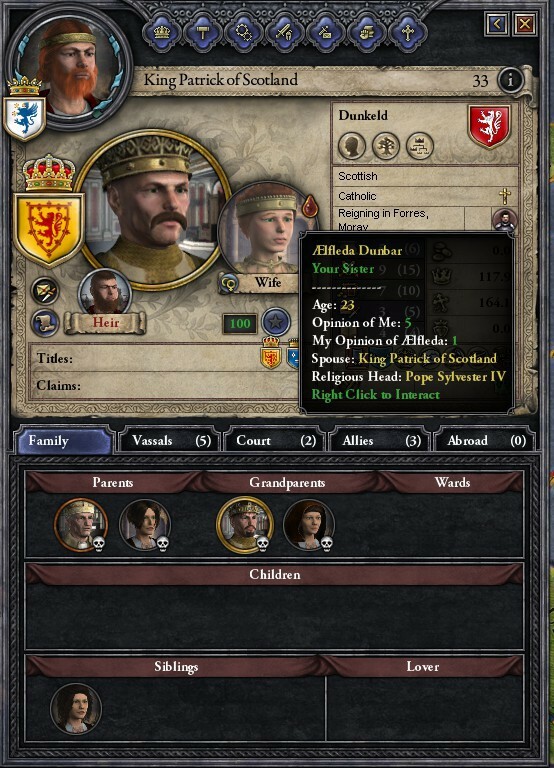 Three thousand of “The Scottish Band” camped around Duke Galloway’s castle and after 2 or 3 months I ordered the mercenaries to breach the walls. The castle fell easily, so the mercenaries took to besieging and assaulting the other baronies of the County. The mercenaries and levies then spent the remaining year besieging every castle they could find. Eventually the Duke capitulated and both he and Edward were imprisoned by the King for their treason. He may execute them, yes, but even treasonous nobles can still have influence – afterall Edward’s Grandfather was King Mael-Snechtai the Great. Well, isn’t this interesting? Here I was worried about my son – and it’s my daughter that’s plotting to kill me. ONE MILLION YEARS DUNGEON!!! And in the year of our Lord, 1115, a son was born to King Patrick and Queen AElfeda. Exxxxcelllent. 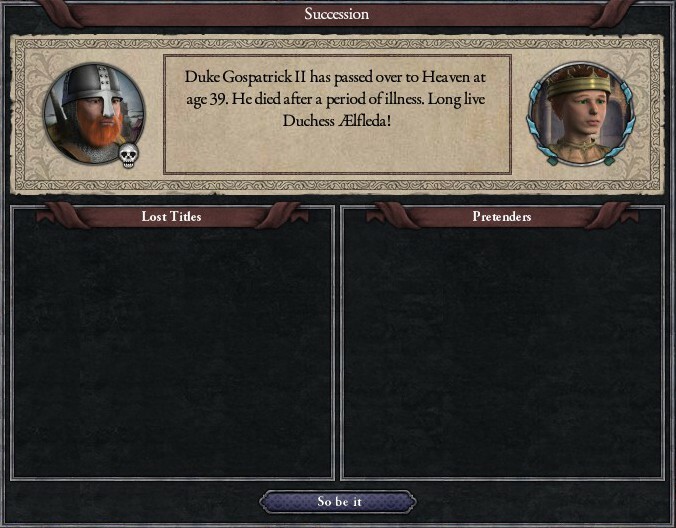 Interestingly the Earl of Atoll has come to me with a plot to kill Dietrich (a babe not even a year old!) Did I not say he would be put-out by a son cutting off his claim? I have declined. 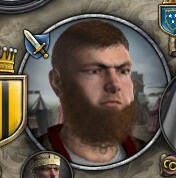 That’s my heir too, so I have no intention of allowing the Earl to further these plots. As soon as I’m Queen I will come up with my own schemes, to counter his. November 1116. I have fallen gravely ill. Is it strange that I hope that I die? And that makes me Queen of Scotland!